A prime rib roast single-handedly defines a special occasion. 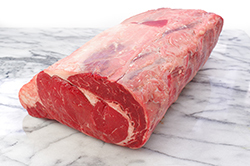 It’s a special cut of meat, a top-notch piece possessing the ideal ratio of marbled fat and tender red meat. We eat very little red meat these days, but find this choice a worthy digression from the norm – it’s not an everyday dish, but rather once in a blue moon event so it’s important to prepare it correctly. Welcoming spring seems like a perfect time to enjoy this “rare” event. 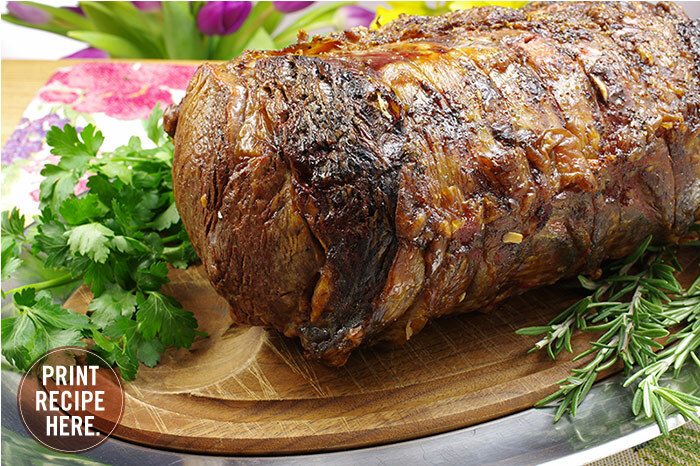 (1) Allow the roast to reach room temperature by sitting on the countertop for 2-3 hours loosely covered. 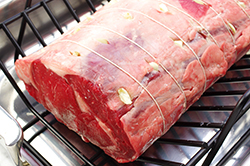 Tie the roast with kitchen twine; this will help the roast to keep its shape and cook more evenly. (2) Prep and peel one bulb of garlic, about 20 cloves or more. 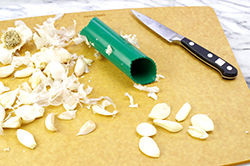 Cut each clove in half lengthwise to expose the garlic flavors. Make small slits in the fat cap of the roast, and slip in a garlic piece. (3) Smear the butter equally on each end of roast to “protect” the exposed ends. Salt and pepper the roast liberally on all sides. (4) Preheat the oven to 500°F. Place the roast on a rack in a large, lightly oiled roasting pan. (5) Roast for 15 minutes at this high temperature to sear the outside of the meat. Reduce the heat to 325°F to finish cooking in a slow roasting mode. Baste the ends of the meat with pan juices occasionally to keep moist. 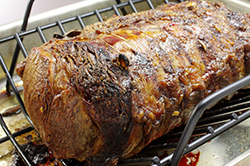 (6) Continue roasting – 15-17 minutes per pound. Use this time calculation as an estimate only. 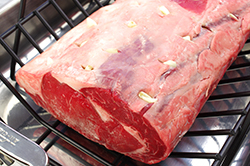 Use a meat thermometer, ideally a remote thermometer, to monitor the internal temperature of the roast. For rare, roast to 120°F; for medium-rare, 135°F. 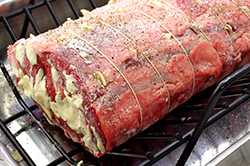 (7) Remove the roast from the oven and tent loosely with aluminum foil for 20-30 minutes to allow the juices to reabsorb. The internal temperature will continue to rise as much as 10-15°F during this resting period; do not allow it to stand too long. Carve the roast crosswise to in slices of desired thickness. Serve while the roast is at its peak.